Britain's rarest freshwater fish, which dates back to the Ice Age, is staging a revival at a loch in southern Scotland. The vendace has only ever been known at four sites - Bassenthwaite Lake and Derwent Water in the Lake District and the Castle and Mill Lochs in Lochmaben. However, it is thought to have died out in all but one of those locations. The fish was introduced to Loch Skene in Dumfries and Galloway in the 1990s, and it now has more vendace per hectare than its only remaining native UK site. The scheme - on the National Trust for Scotland-run loch - was started due to concerns about habitat deterioration at Bassenthwaite. No vendace have been recorded there since 2001. The fish also died out at its two Scottish sites in Lochmaben many years ago. Grey Mare's Tail property manager Dan Watson said the recovery at Loch Skene was a major success. "It is good to know that this rare fish is doing so well here," he said. "This fish has been badly hit by pollution and predation from inappropriate fish introductions in other lakes in the country and can only be found in a couple of locations these days. "The trust is pleased to manage one of its last strongholds in Britain and to be working in partnership on this important conservation project." A recent study into the fish numbers was carried out by the Centre for Ecology and Hydrology (CEH) on behalf of Scottish Natural Heritage. It found almost 10 times as many vendace per hectare in the loch compared to Derwent Water in Cumbria - their only remaining native UK site. "Although our overall aim is the conservation of rare fish species such as the vendace in their native habitats, the use of refuge sites such as Loch Skene is an invaluable approach to avoid the complete loss of a population and its genetic diversity," said Ian Winfield of CEH. "My hope is that one day we will be able to use the vendace population of Loch Skene as a source for fish to be reintroduced to a restored Bassenthwaite Lake." 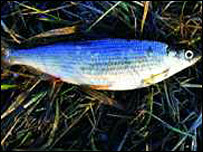 The vendace is a herring-like fish which can be traced back to the Ice Age. Historically, vendace were recorded at four UK locations - Bassenthwaite, Derwent Water, Castle Loch and Mill Loch in Dumfries and Galloway. The Castle Loch population disappeared at the beginning of the 20th Century and Mill Loch shortly before the end.